Blown moulded decanter The body engraved ribbons and swags with the initials A S . Two feathered neck rings and moulded bullseye stopper. Irish C1800. Condition: Very good. There is a blown bubble on the body which has been over engraved which I believe to have been done at the time of manufacture. See image No. 8. 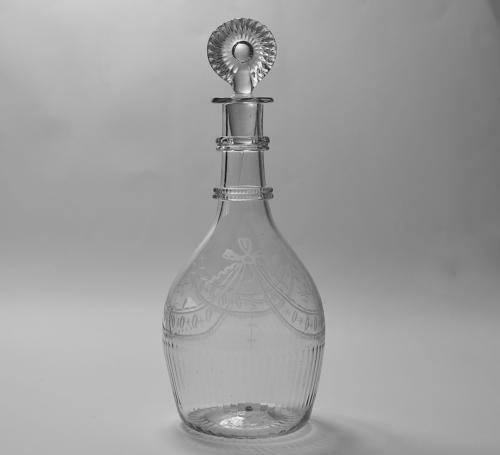 Note: The two feathered neck rings is a feature of decanters made by B Edwards Belfast, however, as the decanter is unmarked it is impossible to say for sure.